A will must be probated. It's not the most enjoyable thing to contemplate your death, but drawing up a will or trust allows you to designate where you want your assets to go when you do pass away. Though it's a common belief that using a trust can save you on estate taxes, that's simply not the case. However, there are other significant differences between wills and trusts that can save you time, money and headaches in other ways. Wills are typically cheaper and easier to create then trusts. If you have a smaller estate, the costs of creating the trust may exceed the savings of avoiding probate. In addition, you don't have to worry about retitling any of your assets or the other formalities that come with holding your assets in a trust. 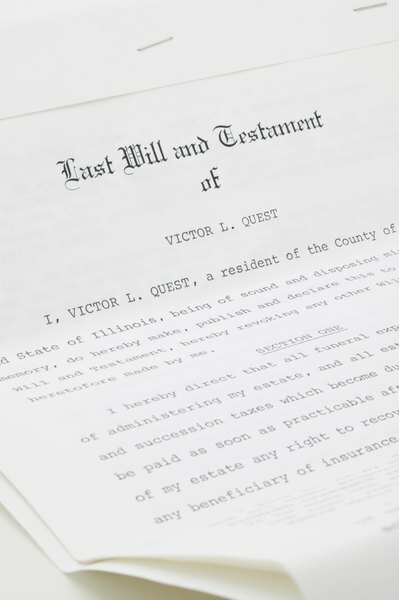 Finally, if you're skeptical that your assets would be distributed according to your wishes, using a will requires court supervision of your estate. A big disadvantage to wills is that they have to be probated, which means a court must supervise the distribution of the assets. This makes the process more costly and more time-consuming. Plus, the court documents are public records, so anyone can take a trip down to the courthouse to see how your estate was distributed. In addition, your will doesn't take effect until you're dead, which means that you can't use a will to name someone to take care of you if you're incapacitated -- you need to draw up other documents to do that. Using a living trust allows you to pass your property to your heirs without going through probate. This typically allows for faster distribution wills, especially in states with complex probate codes, and also maintains the privacy of your estate. If you have property in multiple states, a trust passes the assets without additional proceedings. With a will, you may need to go through ancillary probate proceedings in the other states as well. Finally, your trust documents are effective immediately, so you can include things like end-of-life directives and who should act as your guardian in the event that you're incapacitated. The biggest difficulty with trusts is getting them set up. Trusts generally have higher preparation costs than wills and require you to retitle your assets in the name of the trust, which takes time and money. If you don't retitle your assets, those assets won't pass through the trust and instead will go through probate. In addition to not offering special estate tax benefits, trusts don't offer any special asset protection. Your creditors can still get assets in your revocable trust.